There is no recorded statistics of women who were active in the armed struggle, except of those who were active in the Tamil Tiger movement. 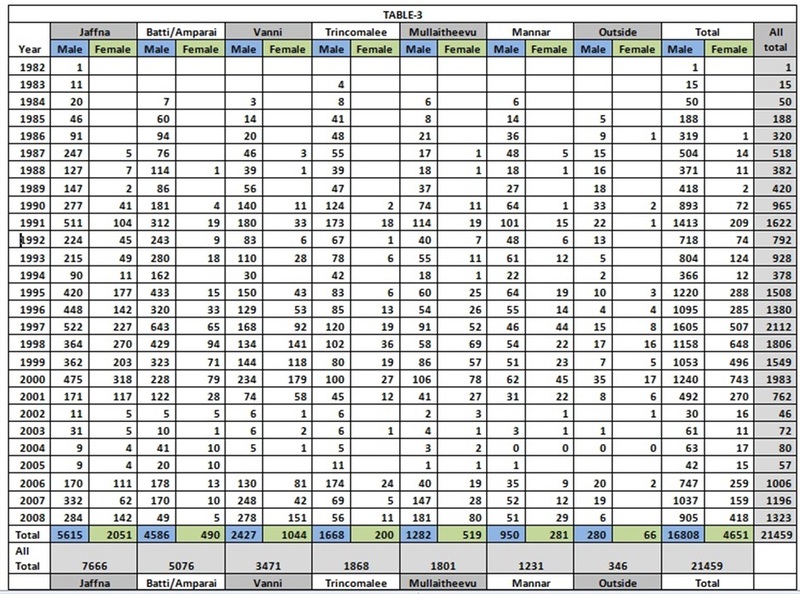 The extent of women’s role in the Tamil Tiger movement can be gleaned from the official statistics of maaveerar, shown in Table-3, published by the Tamil Tigers in Auguts 2008 less than a year before they were destroyed . Table-2 is the summary of the Black Tiger statistics published by the Tamil Tigers. Table-1 summarises the data in Table-3 on a regional basis together with the distribution of Eelam Tamil population as per 1981 census. This data reveals the follows points. Women represented 20-30% of the Tamil Tiger membership and this is proportionally represented in the maaveerar statistiscs as well as in the black tiger statistics. 5-10% of Eelam Tamil women were members of the Tamil Tiger movement. On a per capita basis Vanni districts have given the highest number to the struggle both among men and women. Given that this is where the Tamil Tigers fought its biggest battles this is not surprising. The low participation of women from the eastern regions is a surprise for many people. This may in fact be because the Tamil Tigers did not fully administer a region here. Every women who was a member, that is 5-10% of women, would have known another 10 or more women in her life who was not a member. When viewed in this manner it is possible to imagine the extent to which women came under the influence of the Tamil Tiger women.